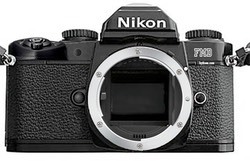 Nikon Rumors this weekend posted information about a full frame retro Nikon camera. If you've got a memory like an elephant, you'll remember that a number of years ago I wrote that Nikon had a prototype FM body for the digital age. It was actually quite unusual in that it didn't have an LCD or battery: you powered the digital sensor using the wind lever. That notion of an homage to Nikon's past has lived on in the product development group for years, with a number of different design variations considered. As I pointed out with statistics derived from my surveys of Nikon users to executives back in 2010, about 20% of the Nikon faithful wanted a small, retro, FM3d type of camera. It appears that Nikon is about to try to see if I was right. The specs of the new camera are still only rumors, but make for an odd mix and match from Nikon's grab-bag of parts. It uses the smaller battery from the D3xxx and D5xxx series, for example, probably because the camera is smallish and doesn't have a deep grip to fit the bigger batteries into. The metering mechanism is mid-range, using the 2016-pixel sensor (Nikon has had everything from 420-pixel to 91000-pixel parts). I think you'll find that the final product has a little bit from a lot of different recent Nikons. Including, apparently, the sensor. Apparently Nikon picked the 16mp FX sensor from the D4 for the camera, which struck me as a little odd until I thought about all those pre-AI, AI, and AI-S lenses that are likely to be used on this type of camera. Simply put, the lower pixel count of the D4 sensor is a better choice for lenses that might not have telecentric light angles to the sensor. While there was initial reports that the latest digital FM variant was mirrorless, the product that we're about to see certainly isn't. Nikon's walking a fine line here. The D610 is their entry FX camera, and very well specified. You can mount AI and AI-S on a D610 and use them just fine. But apparently the new digital FM has autofocus, which is a bit unexpected. When you line up Nikon Rumors' expected digital FM specs with the D610 you find a lot of similarities. So pricing and the more nuanced specifications are going to come into play here. Obviously, there will be no internal flash on this new camera. But it would need a lot of other feature removal for it to be priced below a D610. If it's priced higher than a D610, then the camera starts to be competing price-wise with Nikon's D800 flagship, so there would have to be some "magic juice" in the camera somewhere to justify a higher price. I'm not sure I would have targeted a digital FM as full frame. A lot of the folk who wanted such a camera picked up a D40, D40x, D60, or one of the D3xxx models to use with their old manual focus primes. A better way to slot the digital FM into Nikon's existing lineup would have been to make it APS and introduce a 16mm f/2.8 small prime at the same time, thus killing two birds with one stone. Then a US$1600 price would look just fine, and lots more people would be happy, I think. Click here to take the survey now.